Detail of Emilie Flöge, Klimt’s muse and life long companion. In my opinion, Klimt is an obvious and sumptuous inspiration for a muse. The many colourful and patterned paintings of Gustav Klimt lend themselves to interpretation in fabric. I was instantly inspired, yet also overwhelmed by the options and direction I could take; bright colours, Jazzy or defined patterns, or refined, gold elegance? I decided I would eventually make a whole group of Klimt muses, so there would be no dilemma of choice. I started on the gold elegant one. 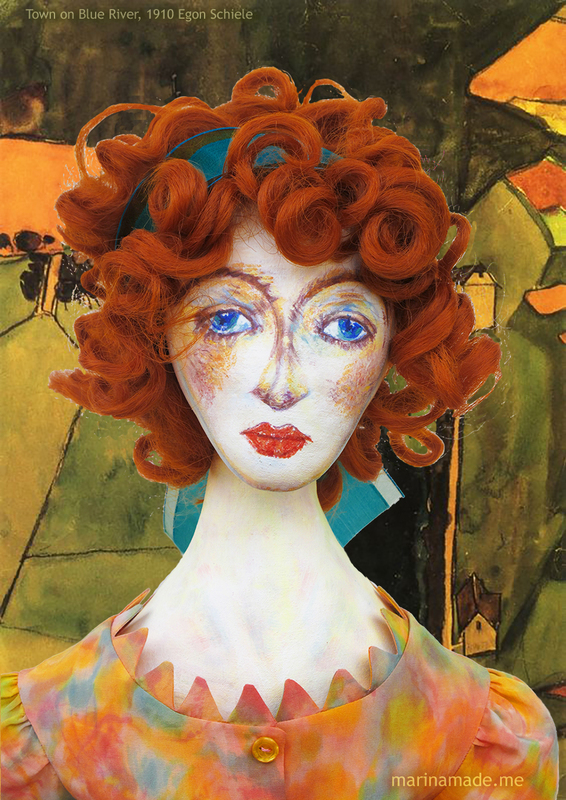 This muse is based on Emilie Flöge, who was the life companion and one of several muses of Gustav Klimt. After searching for fabric that would reflect Klimt’ s vibrant paintings and finding nothing inspiring, I decided to make my own using batik. I knew this would add extra time and work to the project, but I really couldn’t see there would be any other way. Detail of Emilie Flöge muse with lavender. 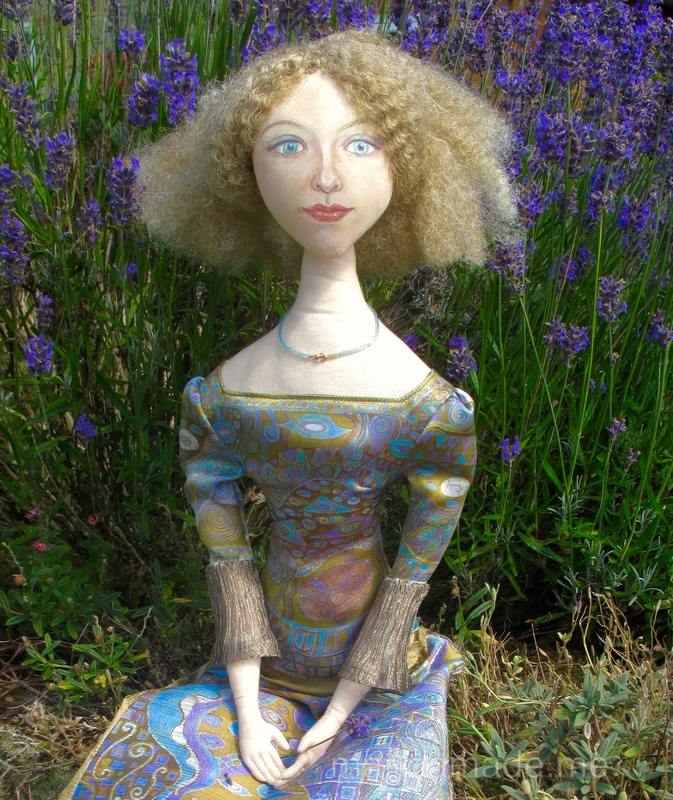 I started by making her body, adapting her shape and using a pale dyed cotton to suit her fair colouring. 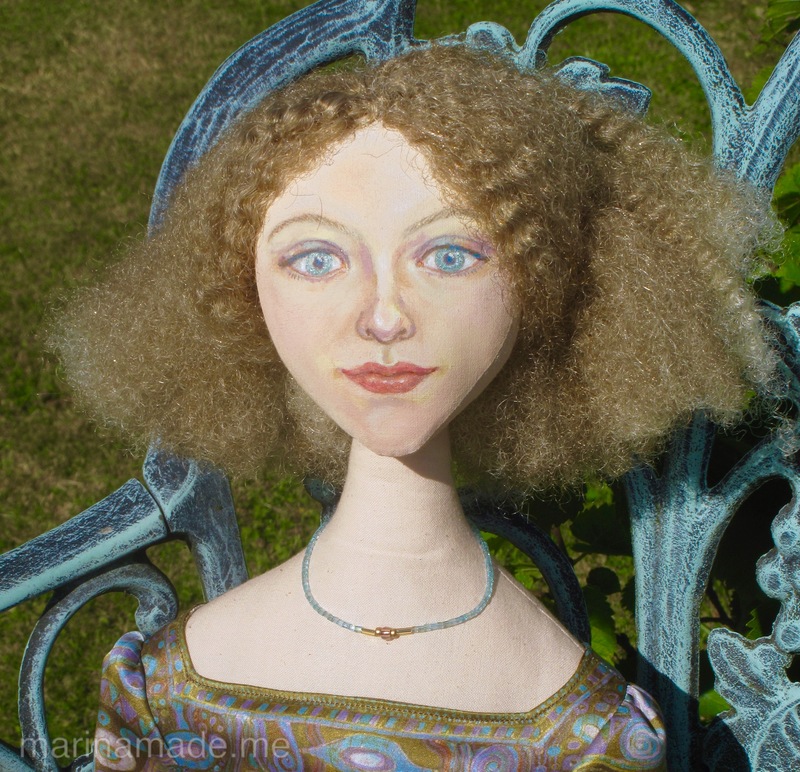 I then painted her face with fine glazes of acrylic, keeping in mind where I would sew on her hair. 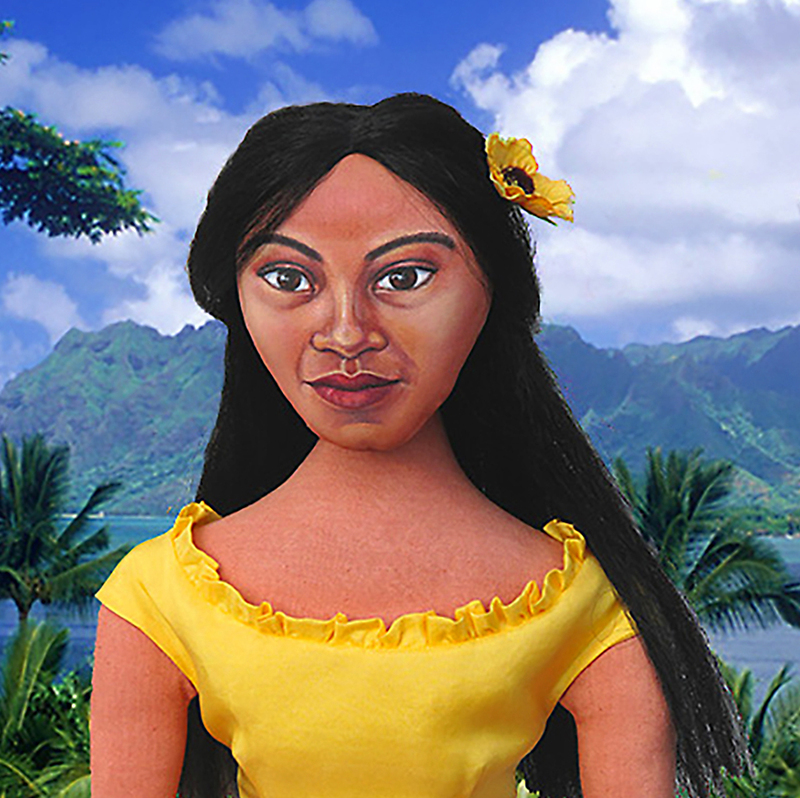 I find hair quite tricky to attach and had to buy a set of long, curved needles to make this task possible. Emilie Flöge Klimt’s muse, early stage my first muse inspired by Klimt, who had several “muses”. Early stages of Klimt and Botticelli muses. Designing the dress top for Emilie, Klimt’s muse. I designed and fitted the dress in calico before cutting into any fabric. The green Liberty print in the photos above was the closest I came to finding a “Klimt” like fabric design, but I opted to make my own in the “Golden Period ” style. 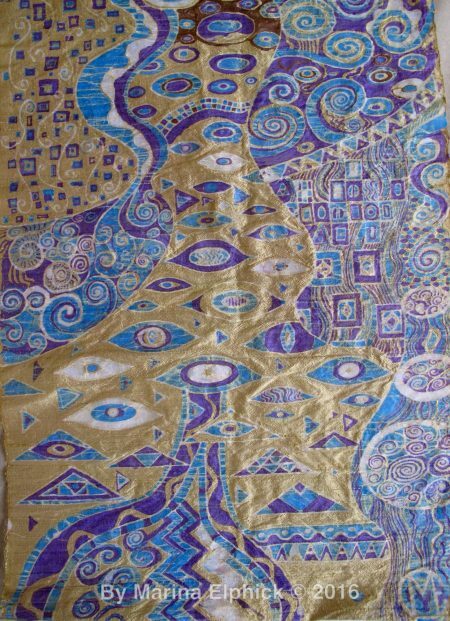 Klimt inspired batik on Silk, to be used to make the dress of Emillie Flöge. It will have a final wax and dye. It is very difficult to draw on Dupion silk with its knobbly weave, so most of my work was done free hand applying the wax directly with the kyska and canting. This allowed for a fluidity and spontaneity which I think enhanced the design process. Below are step by step stages of my batik method; only the white silk and first waxing of white are missing from these photos. 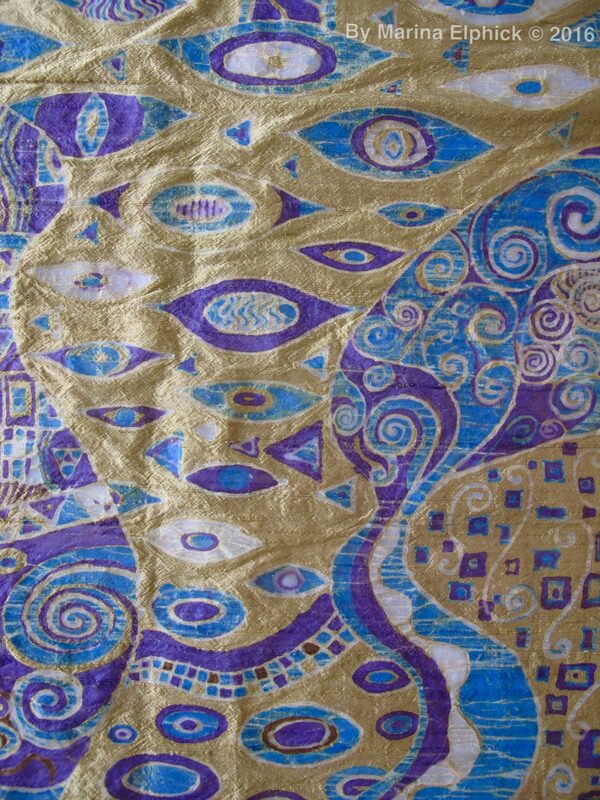 Klimt inspired batik on Silk, by Marina Elphick. Waxing the blue areas of silk that will be used to make the upper dress of Klimt’s muse. White, blue and lilac have been waxed on these silk pieces, that will be used to make the upper dress of Klimt’s muse. Silk that will be used to make the sleeves of the dress. They need final wax and dye for contrast. Silk that will be used to make the bodice of the dress. It still needs final wax and dye to bring out the detail. 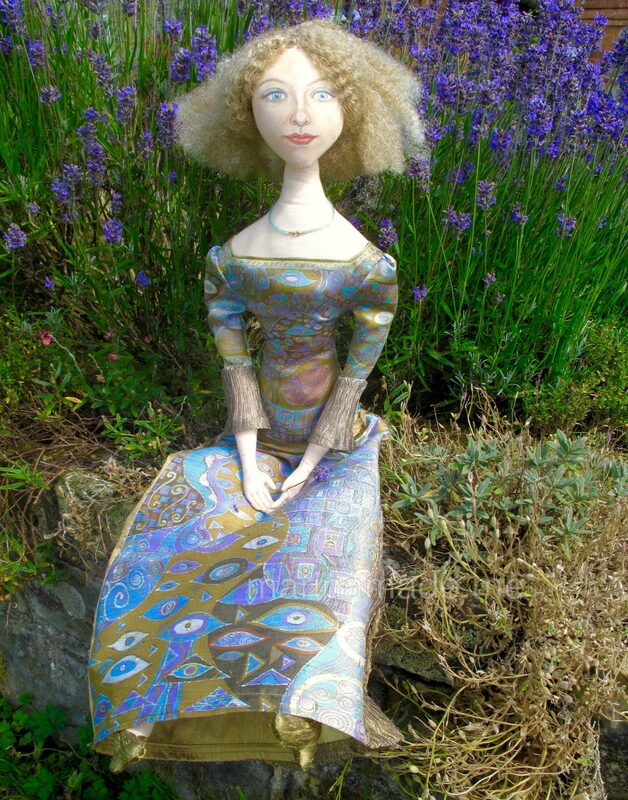 After all my silk pieces were batiked and de-waxed I constructed the dress from my calico toile and paper pattern. It wasn’t easy fabric to work with, it was slippery and frayed, so I lined the dress ( with habotai silk ) to make it more robust. 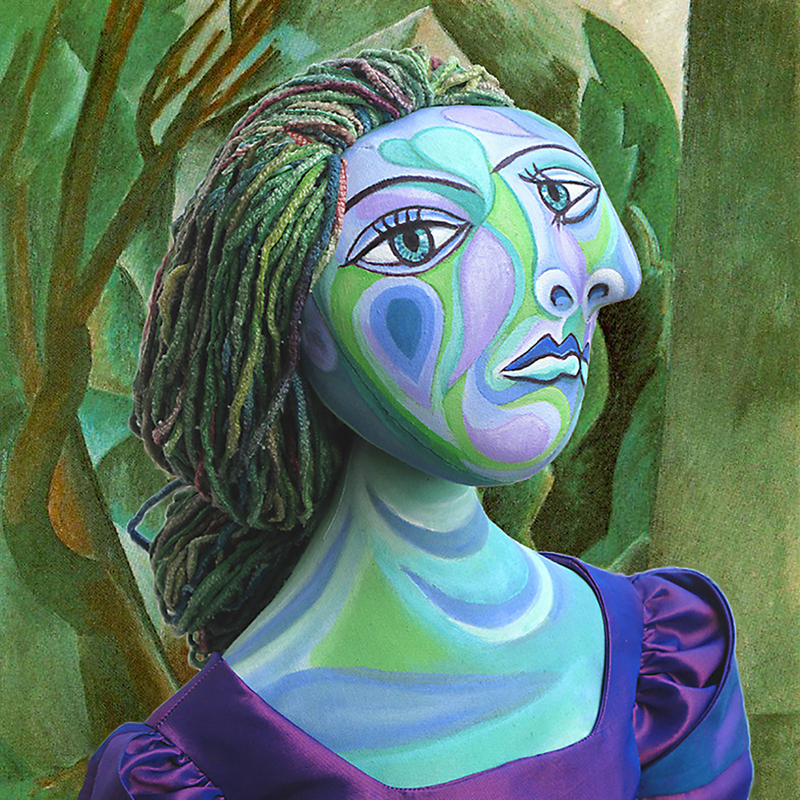 I am happy with the result, but I long to try out other Klimt muses in future. Emilie Flöge was a Viennese bohemian and was a member of the “Fin de siècle circles” movement (turn of the century) a term commonly applied to French & European art and artists, who provided the impetus for movements such as symbolism and modernism. In 1891, Helene, the older sister of Emilie, married Ernst Klimt, the brother of Gustav Klimt. When Ernst died in December 1892, Gustav was made Helene’s guardian, which was common to do at that time. Emilie was eighteen years old and Gustav became a frequent guest at the home of her parents, spending the summers with the Flöge family at Lake Attersee in the Austrian Alps. Photo of Emilie Flöge and Gustav Klimt on Lake Lake Attersee in the Austrian Alps. In 1904 with her sister Helene, Emilie established herself as a successful businesswoman and the owner of the haute couture fashion salon known as Schwestern Flöge, (Flöge Sisters) in one of the major Viennese districts. Her Salon became the leading fashion venue for Viennese society. During her trips to London and Paris she familiarised herself with the latest fashion trends from Coco Chanel and Christian Dior. However, in 1938 during the Anschluss, when Hitler and the German Third Reich took over Austria, Emilie Flöge lost her most important customers and had to close her salon, after which she worked from the top floor of her home. Photo of Emilie Flöge and Gustav Klimt. Though not much is known about the relationship, there was a deep attachment between Emilie Flöge and Klimt that lasted decades. She was portrayed by Gustave Klimt in many of his works and several experts believe that his painting “The Kiss” (1907–08) shows the artist and Emilie Flöge as lovers. The Kiss By Gustav Klimt 1908, painted in his “Golden Period” and thought by experts to show the artist and his muse, Emilie as lovers. Portrait of Adele Bloch-Bauer by Gustav Klimt, showing designs that inspired my silk batik. 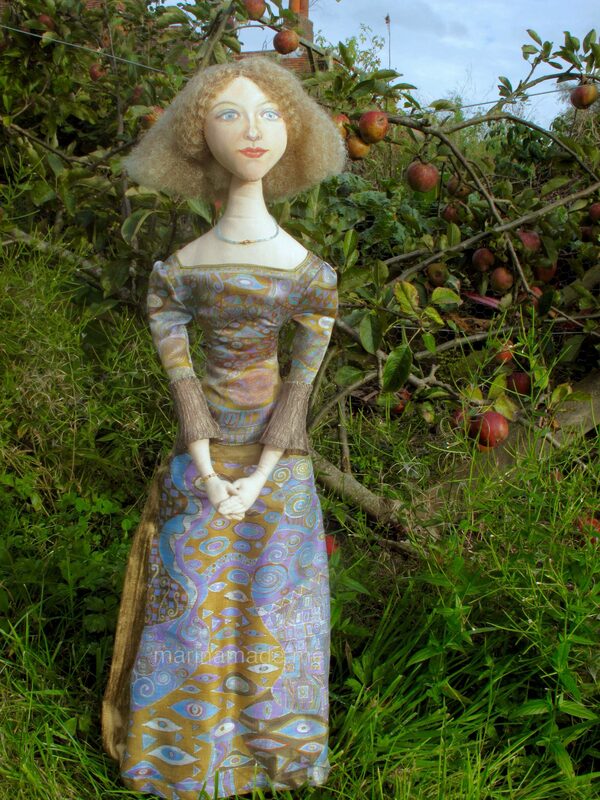 Emilie by apple an tree. Gustave Klimt never married and lived with his mother until her death, only three years before his own. He was the subject of countless rumours in Vienna at the turn of the century with regard to his affairs with his models and with the upper-class women who commissioned portraits from him. Although photographs of the artist – usually dressed in a painter’s smock that resembled a monk’s habit – often portray him as severe and distanced, Klimt is said to have fathered fourteen illegitimate children. His lifelong bond with Emilie Flöge is a bit of a mystery. When their correspondence was discovered, decades after his death, it didn’t actually shed any light on their relationship; instead it seemed to be limited to the communication of routine, trivial information. 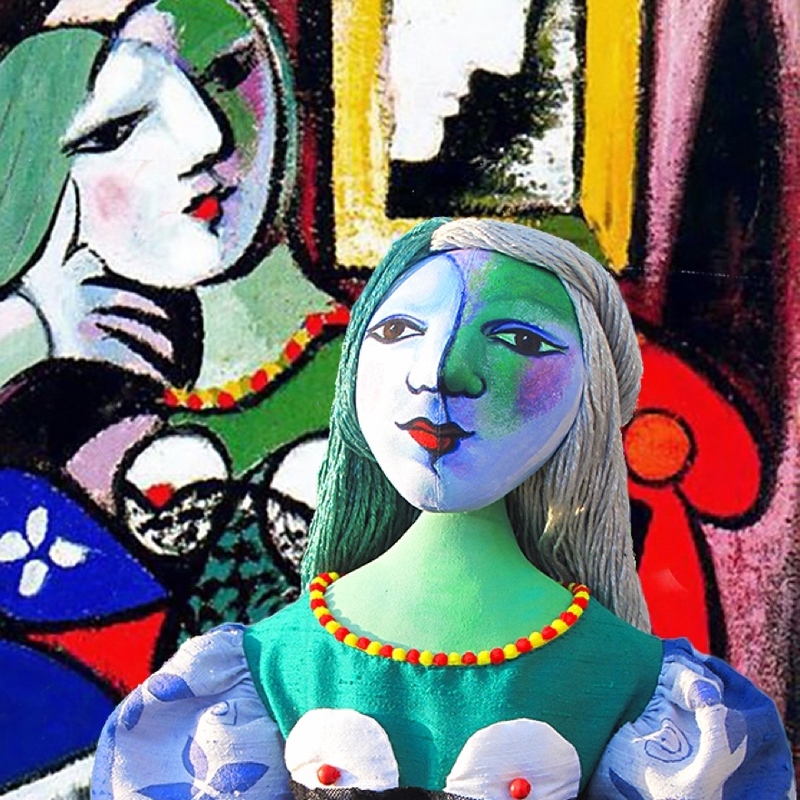 Nevertheless it was the expression of a decades-long, deep attachment between Emilie Flöge and the painter. 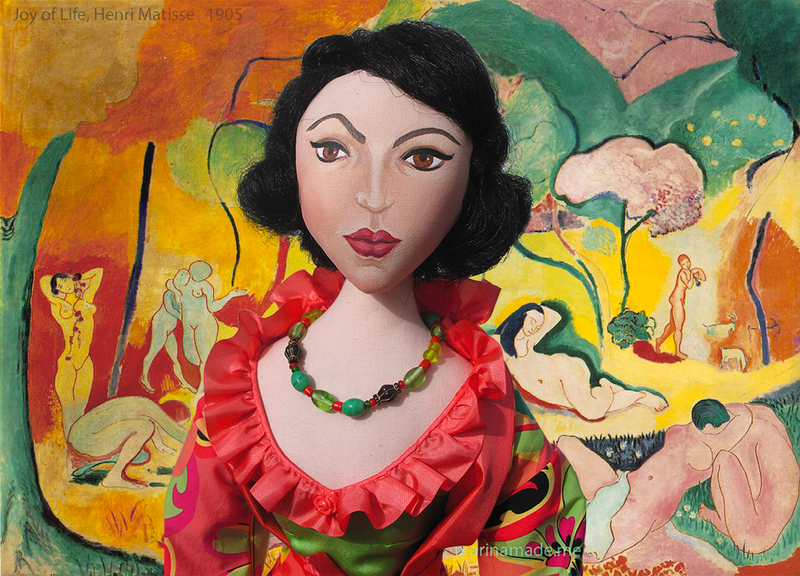 Emilie Flöge wearing batiked silk dress inspired by Klimt’s paintings. 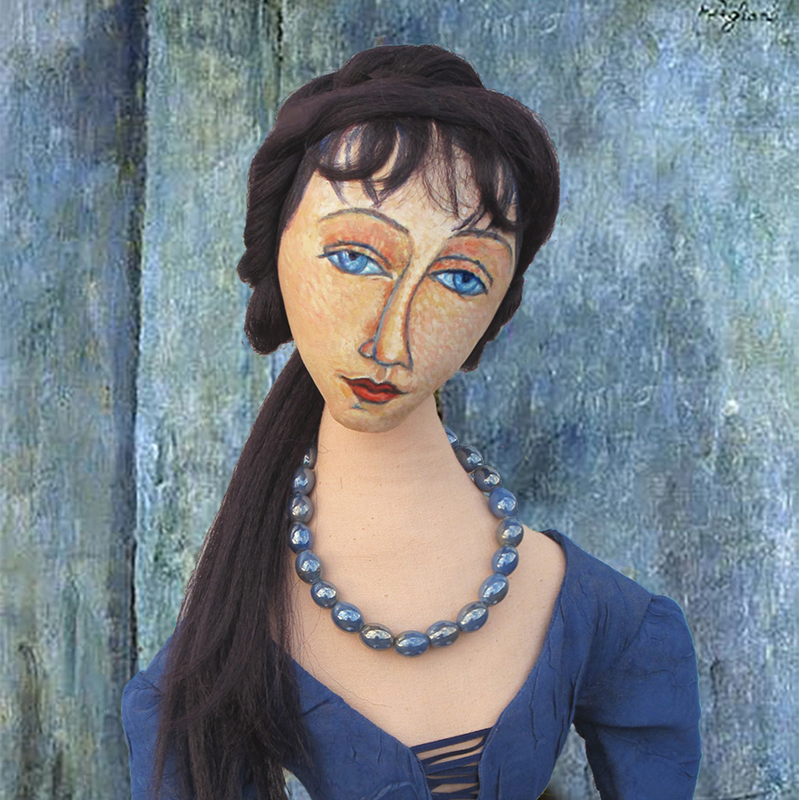 Klimt’s long term muse and companion Emilie Floge, re-interpreted in a soft sculpted muse by Marina Elphick. All fabrics hand dyed and batiked by the artist. 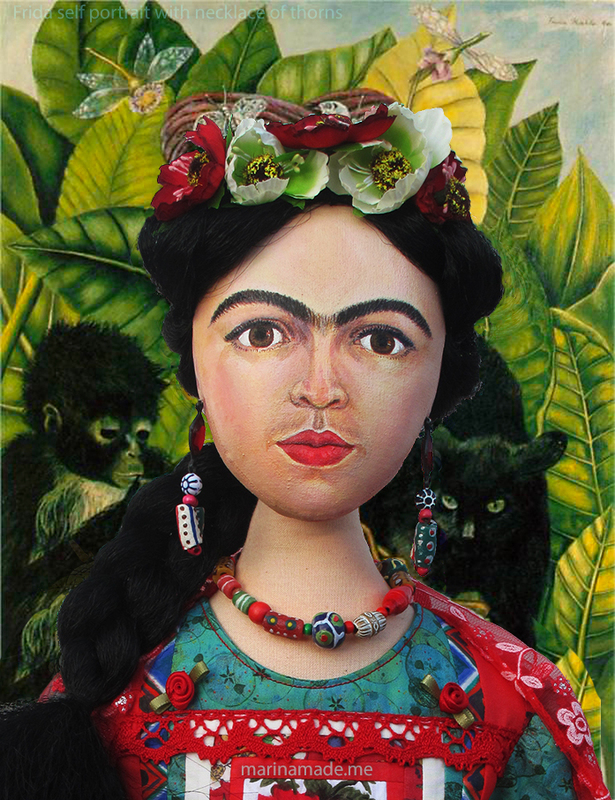 Stunning work Marina, so detailed, so creative! Thanks Barbara, it is a labour of love and has endless possibilities, so keeps me inspired. Marina, Emilie is quite gorgeous and it is not surprising as she has been made with such love and care. If you ever decide to offer her for sale do please email me. Fabulous work Marina! It’s just incredible!